From left are Ryan Lewis, Mason Snyder, Jayden Doyle, Kelly Carpenter and Rachael Billups. 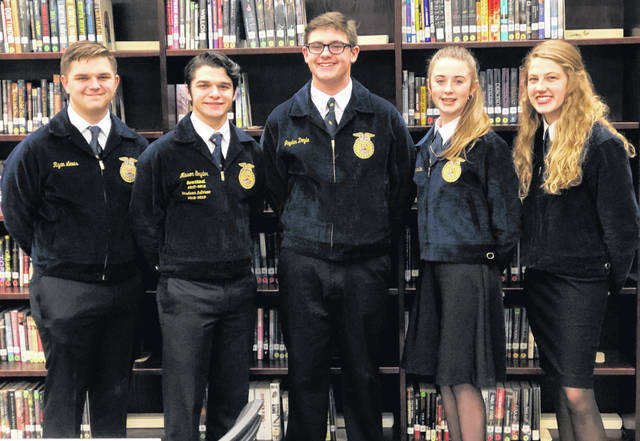 Wilmington FFA excelled at the sub-district public speaking contest on Tuesday, Feb. 5. Members Rachael Billups, Kelly Carpenter, Jayden Doyle, Ryan Lewis, and Mason Snyder presented their preparations and were judged based on memorization and presentation. Rachael Billups competed in the advanced prepared speaking division with her speech “ The Greatest Problem in Agriculture — Ignorance.” She earned second place and will be moving on to district competition in a week. Joining Rachael is Mason Snyder, who competed in the beginning, prepared speaking division with his speech “The FFA Appeal.” Mason won first place! Kelly Carpenter and Jayden Doyle competed in Creed Speaking. The Creed is a five-paragraph speech that helps provide leadership, direction, and value to current and former FFA members. Kelly earned second place and will be heading to districts, while Jayden earned fourth placc. Ryan Lewis participated in Extemporaneous Speaking — he randomly picked a topic and had 30 minutes to research and write a speech about that topic. He earned fourth-place. District competition will take place on Feb. 13 at Peebles High School.